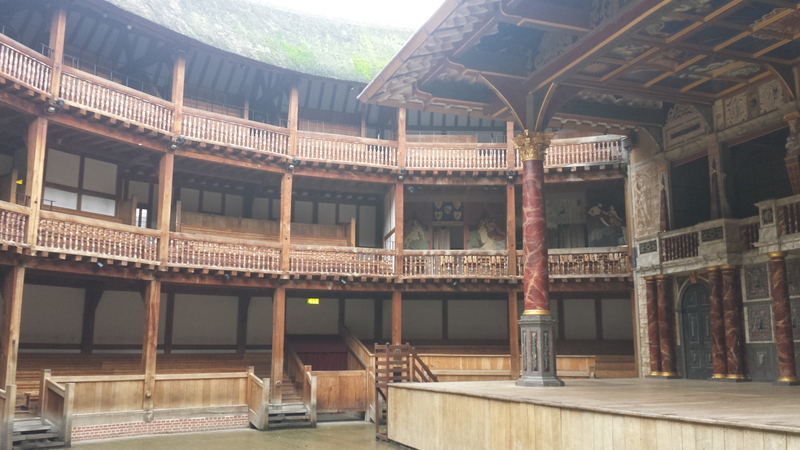 Goodreads Challenge 2014 8/65 – The Time Traveller’s Guide to Elizabethan England. 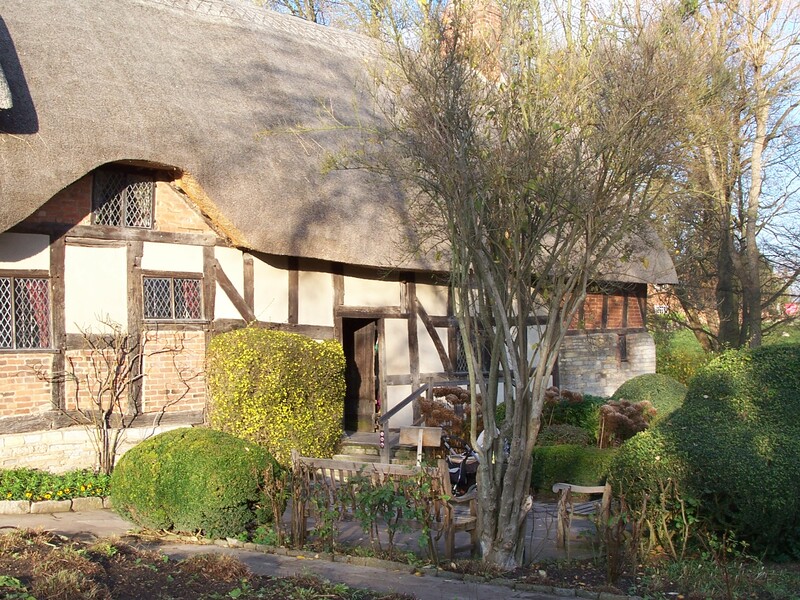 Shelley and I had the good fortune to visit Stratford-upon-Avon some years ago, and naturally we saw All The Things. It’s still quiet and gorgeous it was all delightful. This was where he spent his childhood – his father was a glove maker. 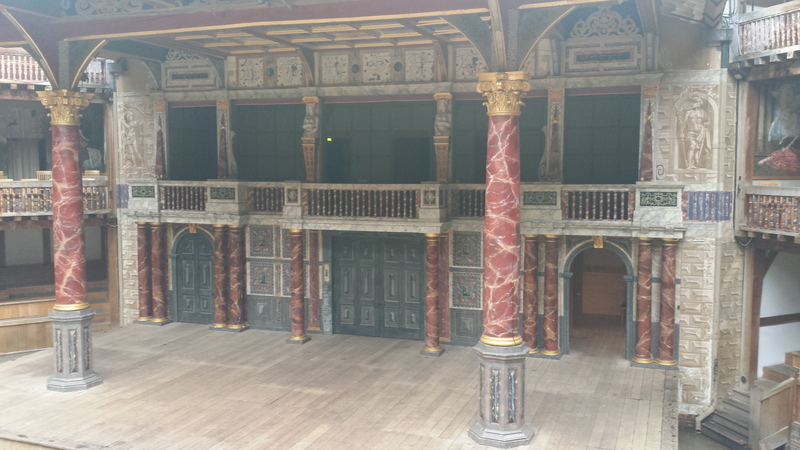 We had even more good fortune when we got to visit the Globe Theatre in London on our last trip. There was no play on at the time (boo! hiss!) but it was still a marvellous visit. We did get to see a RSC production of Richard II at the Barbican though, which was brilliantly produced (and had the wonderful David Tennant as the lead – woohoo!!!!!). 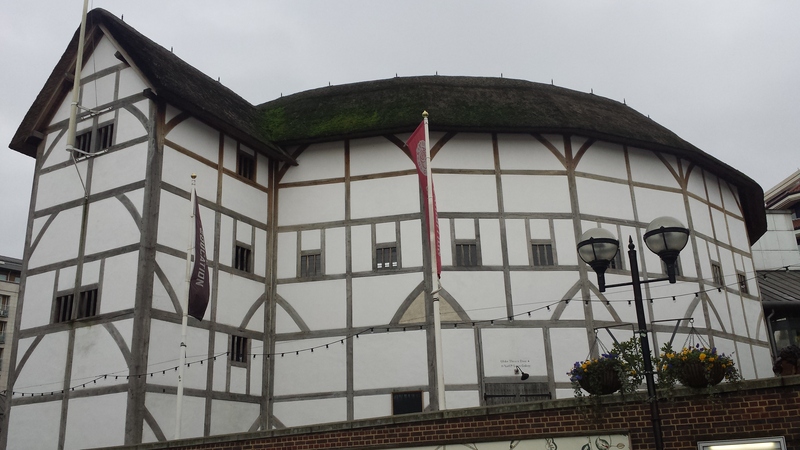 So the book reviewed here was a natural to get while we were at the Globe. And it was an excellent read too, though I admit my attention wandered a little at the description of clothes. But, get it and read on, Macduff, and damned be he or she that finisheth it not! Enjoy your reading, all. I may actually write about things library soon. Elizabethan England is presented as a golden age. It was the period of Shakespeare, the Armada and the voyages of Drake, Frobisher and Raleigh. 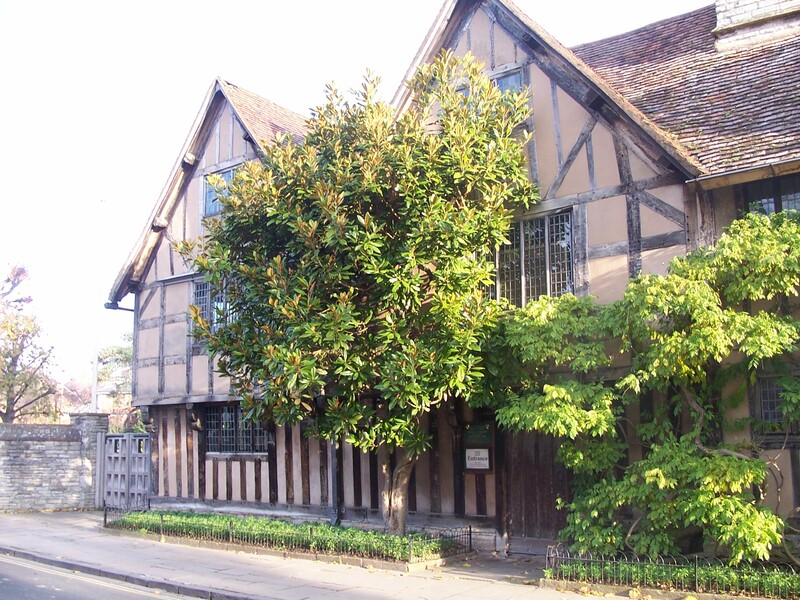 The music of William Byrd and John Dowland graced court and church. And at the apex, ‘Good Queen Bess’, defender of English freedoms. Hindsight of course it a wonderful thing and Ian Mortimer tried to show us what it was like to live there. Would we, living at that time, view it through such rosy-hued glass? The first chapter teases out the changes in landscape that were still underway. Medieval towns were slowly. Some of these are technological. Hall-hoses begin to make way for multi-storied houses because the chimney offers multi-floor heating. England is still very much a landscape, as opposed to a cityscape. By 1600, only five of the top 20 towns in England have more than 10 000 residents. Of these, London has 200 000 and the remaining four (Norwich, York, Bristol and Newcastle) have 10-12 000 each. Oxford and Cambridge have but 5000 each. Yet the urban centres were growing. It was a much younger population, with just over 7% of the population older than 60. Social hierarchies from the medieval period continue, though the independent power of the great families is now much less. Social status is shown outwardly through clothing. The Sumptuary laws rigidly defined what type of cloth, what colour and so forth a person might wear. One reason that some builders and masons were able to grow wealthy was that they could not spend their money on the luxuries of their ‘betters’. Religion set out the parameters in which conflict with other powers took place. Elizabeth’s re-assertion of the monarch as head of the church in England gave Spain a cassus bellum – the re-imposition of the Holy Catholic church. Of course, English Catholics were thought therefore to be agents of Spain and the Pope. As indeed some were. But even for those loyal to the Crown, it wasn’t a good time to be Catholic. Once could choose to be Catholic. 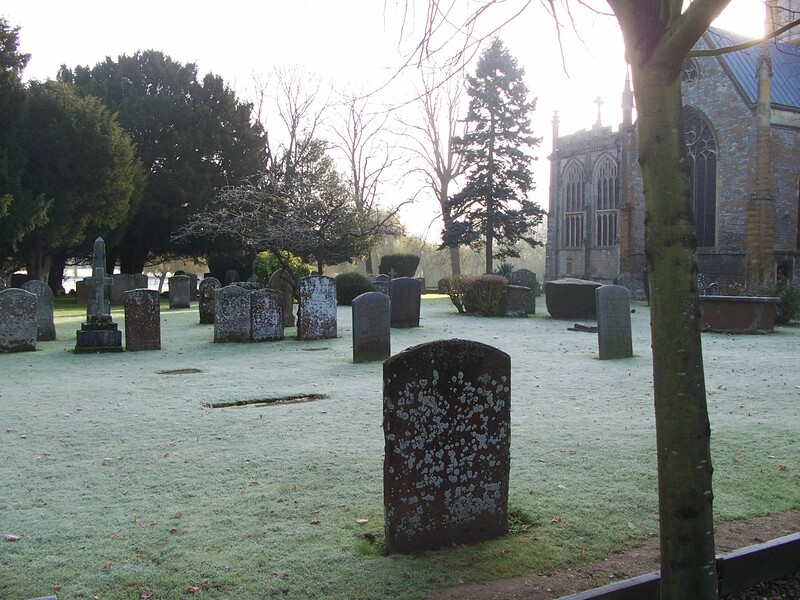 One simply had to pay a fine for each Sunday that they did not attend a Church of England service. That weekly fine was 20 pounds per month. A farm labourer might expect a bit over one pound per year. Geniuses are not usually singular products but are created by their environments. One reason that Shakespeare was such a great talent was that he wrote in a milieu of great talent. He had to compete with the likes of Johnson and Marlowe. It was not a period. As Virginia Woolf in A Room of One’s Own points out, it was impossible for a woman to attain such levels of genius because there was simply no opportunity. Woman by and large don’t own property and can be beaten by their husbands for ‘disobedience’. They were still legally not far removed from chattel. Yet many proved capable of running their households when their husbands we incapacitated (or dead). We are products of our time, and so the things that we take for granted in the west are integral to our makeup. Access to clean water, decent health care and goodly quantities of nutritious food are things that many on the planet still have no access to. This is a wonderfully written examination of a fascinating period. If you have particular interests you can concentrate on some chapters and skip others. But it’s really worth reading all the way through. It is no doubt an era that I’d not want to live in permanently. But should The Doctor happen by with the TARDIS, I’ll make sure that I have this book with me. I am aware, of course, that The Doctor would be wary of stepping foot here again, lest Elizabeth divorce him. With an axe. Last year I was fortunate enough to attend the Adelaide Writers’ Festival and see a panel with Tom Holland and Tom Keneally on the writing of history. 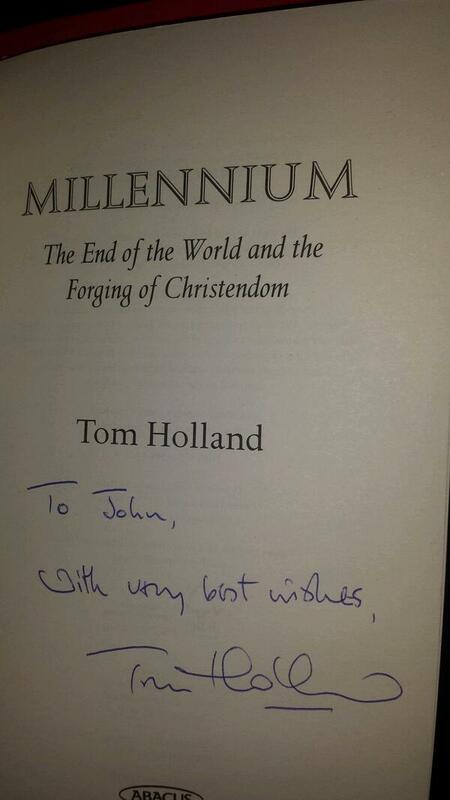 While there I bought a copy of Tom Holland’s Millenium. Despite my best efforts it remained on the shelves unread. But its call persuaded me that it would be a suitable volume to take on holiday over the Christmas/New Year period As I would be in Bayeux for a good chunk of it it proved to be an apposite choice. The events of 1066 get a chapter to themselves, and as it happened I read it while in Bayeux (and I still smile thinking about it). I wanted to write a longer and more considered review, but I was in holiday mode, and took very few notes. Mind you, Bayeaux is completely beguiling, and probably no notes would have made sense. 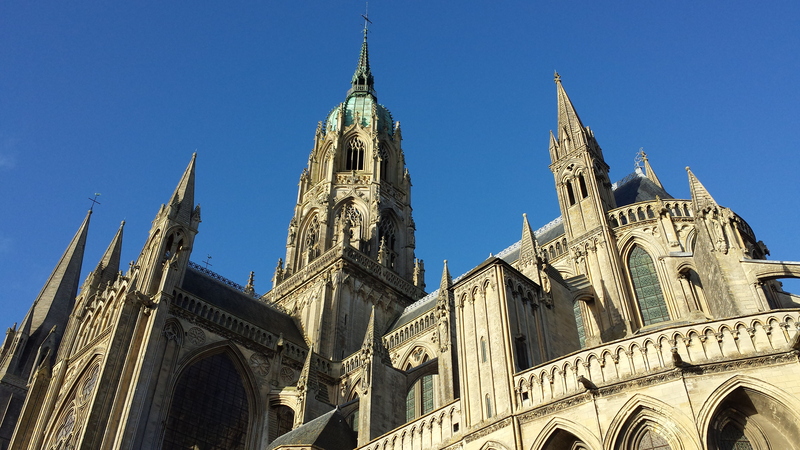 This is the cathedral at Bayeux where for many years the famous Tapestry (ok, it’s really and embroidery) was housed. The Goodreads review that is below will have to do. Suffice to say that I really enjoyed it, though it may not be everyone’s cup of tea. A guy that I once played Dungeons and Dragons with was (and for all that I know is still) a member of the Society of Creative Anachronism. Its members dress as lords and ladies, knights, priests and monks (so far as I know, never as peasants). When we think of the Middle Ages in Western Europe, we think of a society with a strict hierarchy of classes based on birth in which peasants are tied by law to the land of a particular lord. More specifically, we think of a society in which the Roman church wields enormous power and that commands an infrastructure that sits alongside (and runs across) medieval kingdoms. Millennium covers the roughly two hundred years from the early 10th to the late 12th centuries. The midpoint of this period is the turn of the millennium. Some thought that this would usher in the final Apocalypse. There was no universal agreement on the date – some thought that the Millennium of Christ’s crucifixion, resurrection and ascension, would mark its beginning and calculated the date of the final day accordingly. We are reminded, unlike the fears of a nuclear apocalypse in the late 20th century, ‘for the wretched, for the poor, for the oppressed, the expectation of the world’s imminent end was bred not of fear but rather of hope’. The millennium as such is not really the focus of this work, though it casts a shadow across the length of the book. The focus is the forging of Christendom, and how it was that the Roman church spread far beyond the lands taxed by Roman emperors. Within that is also the struggle for power between Pope and Emperor. Holland reminds us that the civilisation that we think of as medieval didn’t start the Middle Ages so confidently. At the start of the 10th century, Spain was under the sway of the splendour of medieval Islam. The great cities of Europe were by and large located there. Cordoba, we learn, ‘had originally been a Roman foundation – but the capital of Al-Andalus, as befitted so fattened on the fruits of peace had long since burst its ancient walls’. Meanwhile, Saracen incursions in the south of France and Italy were common, from their domains in North Africa and Sicily. Nor did the church have the independence that we associate with the medieval period. On Christmas Day 800, Pope Leo III crowned Charlemagne Holy Roman Emperor in Rome. Since then, Emperors took for themselves the right to appoint bishops within their domains. For Holland, the decisive event was the humiliation of the Emperor Henry IV by Pope Gregory VII at Canossa. At stake was the right of a secular power to appoint bishops. Henry denounced Gregory as Pope, and in response Gregory issued a bull of excommunication. Travelling as a penitent to meet the Pope, Henry was refused entry to Canossa for three days. Henry backed down, and he was readmitted as a communicant. It was a pivotal moment because by removing a monarch’s right to appoint clergy (inadvertently) opened up the possibility of a separation between clerical and secular polities. This may be a confusing work for some because the scene changes from the Holy Roman Empire, to the Normans, back to the Empire, and so on. There is more material on the Roman west than on the Orthodox east, though if Holland is right and that Canossa is such a pivotal event, this is understandable.There are some lovely passages of prose which for me are dabbled in pleasing quantities, though tastes will vary.